Tony Smith: Smoke has become a LACMA icon since its 2008 installation in the Ahmanson Building atrium, where it animates the transitional space between the museum’s east and west campus. 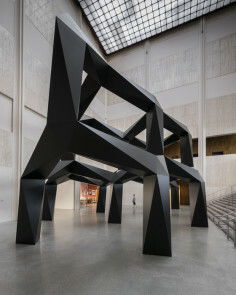 In addition to being one of the largest sculptures ever conceived by Smith (and the largest conceived for an interior space), Smoke reflects the artist’s lifelong exploration of patterns found in organic life and represents a culmination of his work in architecture, painting, drawing, and sculpture. This exhibition includes approximately 25 objects in all media that trace the work’s evolution, beginning with his early Frank Lloyd Wright-inspired buildings of the 1940s and early 1950s, cellular drawings and paintings from the 1950s, and related sculpture and sketches from the 1960s and early 1970s. Also included will be documentary material related to Smoke’s installation in the 1967 exhibition Scale as Content at the Corcoran Gallery of Art, as well as photography and video from its installation here at LACMA. Smoke was designed in 1967 by American artist Tony Smith. It’s impact was so successful it made the cover of TIME magazine the same year. The only large-scale work Smith ever created specifically for an interior space, Smoke now enchants passers by in its new outdoor home. This two-tiered aluminum sculpture stands 24 feet tall and is a combination of geometric components, including five tetrahedrons and forty-five extended octahedrons. The sculpture’s powerful form is based on the artist’s fascination with geometry and the morphology of organic shapes, like crystals and honeycombs. The first version of the sculpture was made of painted plywood. Another version of Smoke can be seen at LACMA, the Los Angeles County Museum of Art. Tony Smith (1912-1980) was an American sculptor, visual artist, architectural designer, and a noted theorist on art. He made more than fifty large-scale sculptures in the final two decades of his life. Smith’s work is included in leading international collections, such as the National Gallery of Art, Washington, DC; the Museum of Modern Art, New York; the Menil Collection, Houston; the Los Angeles County Museum of Art as well as the Kröller-Müller Museum in the Netherlands, among others. L’opera è diventato un’icona del LACMA sin dalla sua installazione del 2008 nell’atrio di Ahmanson Building, dove anima lo spazio di transizione tra il campus orientale e quello occidentale del museo. Oltre ad essere una delle sculture più grandi mai concepite da Smith (e la più grande concepita per uno spazio interno), Smoke riflette l’esplorazione permanente di modelli trovati nella vita organica e rappresenta il culmine del suo lavoro in architettura, pittura, disegno, e scultura.